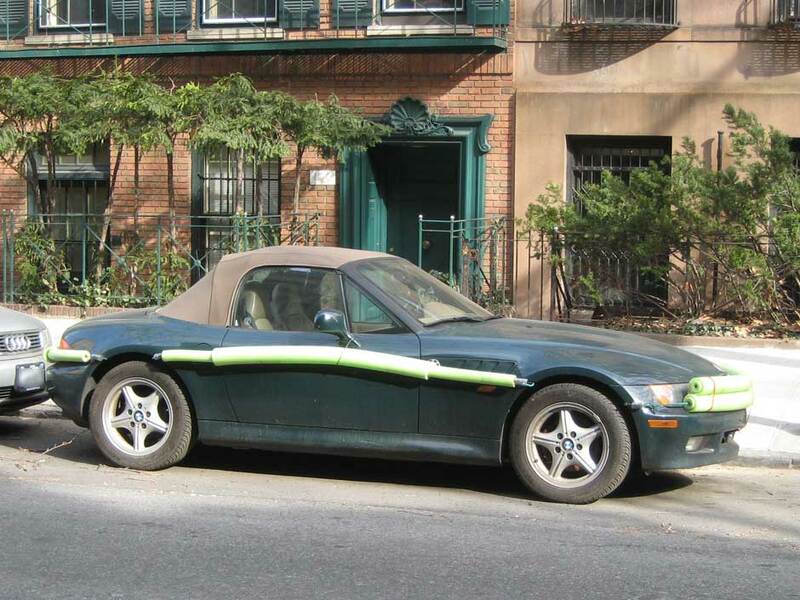 On my way to work this morning (yes, I had to work today), I spied this BMW parked near Park Avenue. What caught my attention was the obviously hacked together bumper guards. Why pay $150 for professionally made bumper/door guards when you can grab some bungee cords, duct tape, and foam pads from Home Depot and make your own? I think the door and sides are sufficiently protected, but I don’t think the front and rear bumpers are. You know, if you’re going to make your own, why use day-glow green? I would think one would try to work with the color scheme of the car, or at the very least, use a dark color if the car is dark in color, and a light color if the car is light in color. Heck, black goes with pretty much everything.